The evening of May 22, 2013 is fair and sunny. The seas are calm, and the atmosphere on board is cheerful. This afternoon, we finished the last tasks on the NEPTUNE Canada portion of the Ocean Networks Canada Installation and maintenance cruise. We are on the long transit back to Saanich Inlet to continue the last 2 days of work on the VENUS network. Thanks to the Tully crew and the ROV crew, along with all the cruise participants for making the operations a success! A new camera with a Ti pan and tilt was deployed on a tripod away from the platform. Cable for Nortek HR-Profiler was changed from 15m to ~10 m to mitigate data transmission issues. 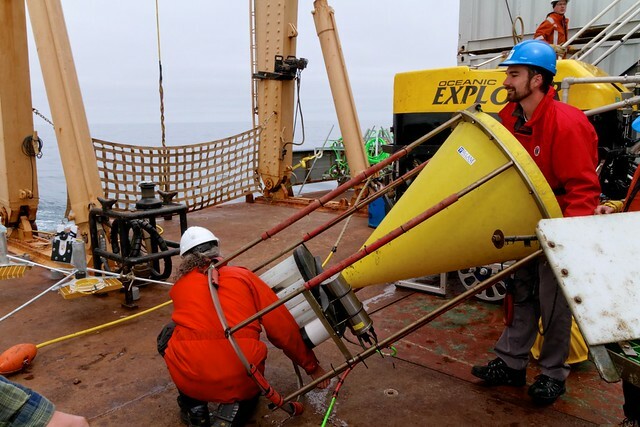 A new high-frequency hydrophone was deployed at a maximum feasible distance away from acoustic instruments at Upper Slope. A new camera with a Ti pan and tilt was deployed, replacing the camera with “tunnel vision” and aluminum pan and tilt. An issue with the junction box arose which prevents the P&T on the camera to be used. Camera is in a fixed position, pointing approximately 45 degrees to the seafloor. INDEEP experiment deployed out of the fixed field of view of the camera. A Seabird 16+ CTD with oxygen on a tripod away from the instrument platform replaces Microcat. The vertical profiling system platform was recovered. Imagenex sonar retrieved due to power supply noise issue. Seabird 16+ with fluorometer and oxygen sensors on the platform. POD4 camera under platform was removed and replaced by POD3 camera (see below). Sediment trap samples were retrieved, trap was reset and redeployed. Replace Kongsberg rotary sonar for seal maintenance. The POD1 camera with a new Ti P&T was deployed on a tripod away from the platform. Note that a new camera was intended for this site, but due to an electrical issue with the lasers, the POD1 camera was redeployed at POD3 instead. Recover the plankton pump. On inspection on the deck, it was discovered that the instrument did not sample as planned. A Seabird 16+ CTD with oxygen on an underwater mateable connector was deployed. 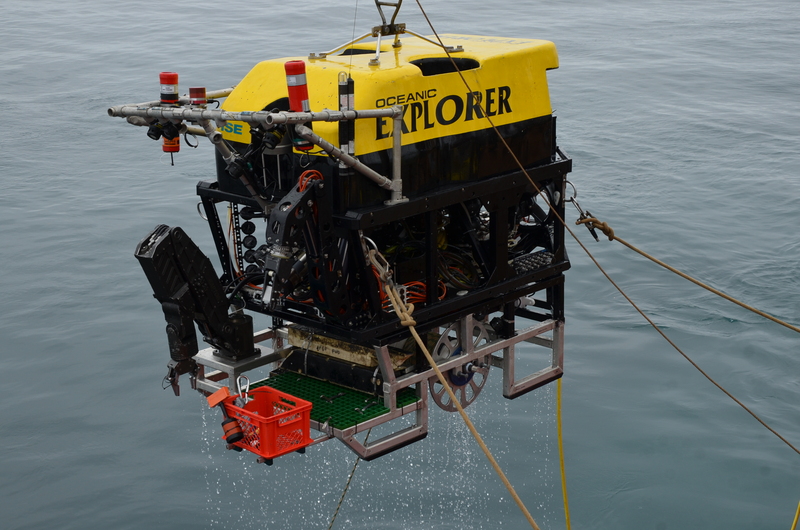 A Kongsberg rotary sonar on a tripod for tracking Wally and imaging hydrate mounds was deployed. A 2nd tripod was deployed for later instrument connection. A Seabird 16+ CTD with oxygen on an underwater mateable connector was deployed in addition to the Aanderaa optode at the same location. A new HF hydrophone was deployed replacing the existing hydrophone. RDI 300kHz ADCP replaced on the platform.